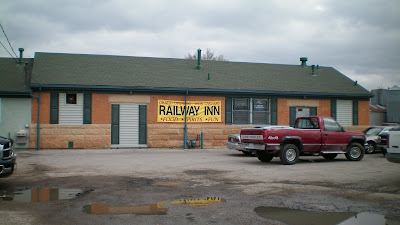 It appears the full name is Dan and Jami's Railway Inn. Its in a tough industrial neighborhood beneath the busy main thoroughfare of Council Bluffs. This bar and grill won a readers poll in the Council Bluffs Daily Nonpareil a couple years ago for the best tenderloin in town. Location: 112 S. 15th St. in Coucil Bluffs, in Pottwattamie County, about 2 hours from Des Moines or 10 minutes from Downtown Omaha. Directions: It appears on a map like its just off Highway 6/West Broadway, however, you have to weave around some sidestreets and get under a bridge that goes over the railroad tracks. Just make sure you are on the east side of the tracks when you get off the highway. 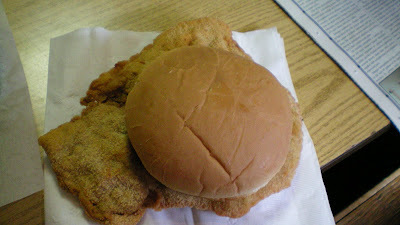 The Tenderloin: From above, this took the classic triangle 'loin shape with little arms sticking far from the bun, from the side it was uneven in thickness. This is at least eight ounces of pork before preparation. 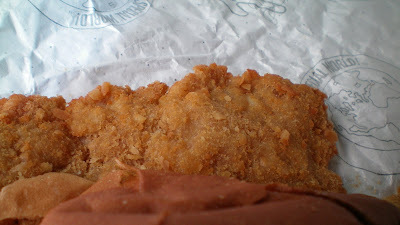 The breading delivers plenty of crunch. Served with all the fixins on a well-toasted bun. Overall 7.5/10. Price: $5.95 with homemade fries. Service: I was there around lunch time and it looked like just one guy running the bar, the grill, and waiting tables. He seemed to have a good relationship with what appeared to be many regulars and an overall older crowd. Ambiance: Its the usual pub and grub with railroad signs, and beer posters hung on the walls in a dimly lit interior with the usual bar gaming machines. There are tables and booths, and outdoor seating when the weather is good enough for beach volleyball. Also on the Menu: Its typical bar food, with the usual fried suspects, the specialty is the huge Railway Burger, and the homemade hand-cut fries are good too. Final Thoughts: From the outside it looks humble, with the puddles in the parking lot and sand blowing around in the wind. But this unpretentious place is definitely worth the short drive on Highway 6 from downtown Omaha. 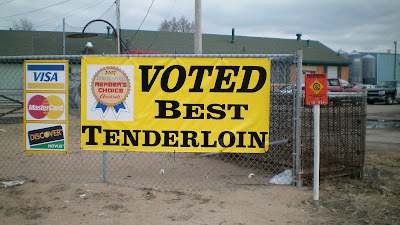 If a restaurant has a hand-painted sign advertising a tenderloin, i guess its a good bet that the tenderloin will be homemade as well. The window claimed "Tacos and Lots More" so I figured it was worth a try. 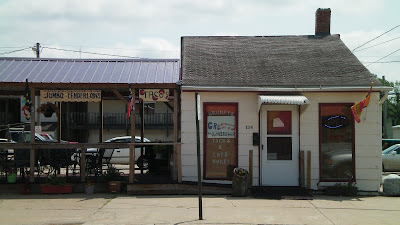 This little place looked like it was once the location of a small-town coffee shop. It was just one tiny room with a door into a kitchen. Location: 114 S. Grand. St. in Chariton, in Southern Iowa. Its just off the square to the southeast. Directions: Chariton is about 50 miles south of Des Moines. You can take I-35 south to Highway 34 West, or take Highway 65 south from the Eastside of Des Moines. 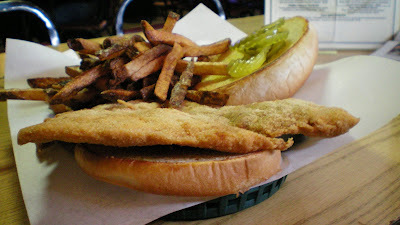 The Tenderloin: This sandwich wasn't exactly creating with take-out service in mind. The wrapper barely fit around the whole sandwich, but I didn't mind. 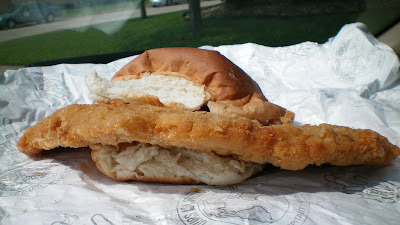 The bun was more like a joke, it was just a dry roll that barely held its own part of the tenderloin. The meat just stuck so far from the roll. 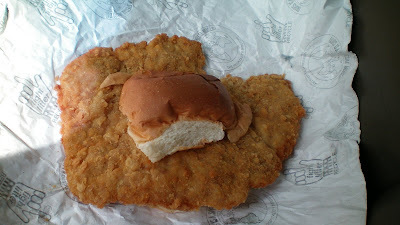 The soft and steamy inside was falling from the breading in some parts. 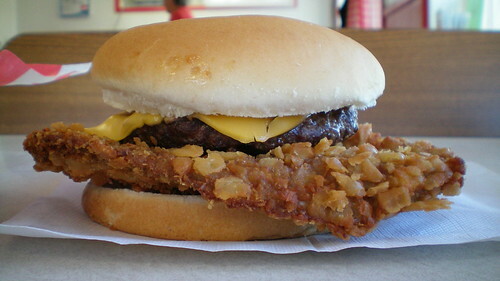 The tenderizing made for an uneven sandwich with some parts much thicker than others. Overall 8.0 out of 10. Price: $4.99, with fixins. Fifty cents extra for a second bun, its like a plate-splitting fee at a fancy restaurant. 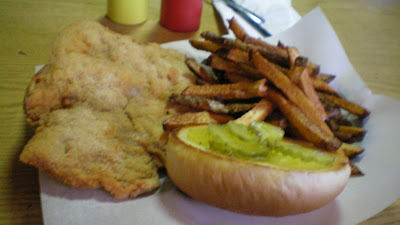 Half-size tenderloin also available. Also on the menu: Small-town Mexican menu with tacos, a Red Taco, and smothered burritos in addition to sandwiches and ice-cream. Service: Well, the lady took my order then disappeared into the kitchen just behind a door, I heard the tenderloin hit the fryer immediately. Ambiance: The small interior had a few tables to sit at, the walls were covered with patriotic stuff and HS sports posters. I think a patio opens up when the weather is better. Final Thoughts: I had been frustrated in some of my trips through Southern Iowa before. 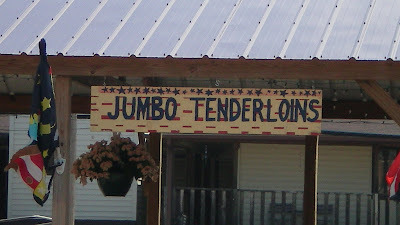 But this is up there with other super-jumbo tenderloin I've discovered around Iowa. The whole thing is just massive.